Working class. Traditionally the working class has been defined as a social class made up of wage laborers (and their dependents) engaged in material production in industry or agriculture who do not own the means of production they use in their labor. The working class thus differs from artisans (see Crafts), peasants, and the intelligentsia. Soviet statistics agencies defined the working class as an aggregate of persons involved in predominantly physical labor in the nationalized sector of the economy. According to that criterion junior service personnel and guards were included in the working class, as were state farmers. Collective farmers were not, because they formally owned the means of production, except the land. There has been much debate on how to define the working class. Many sociologists in Ukraine and the USSR have argued that collective farmers should be included in definitions of the working class because the division between collective and state farmers is artificial; that is, the ownership of the means of production on a collective farm is fictitious, and the work performed by collective and state farmers is similar. Moreover, sociologists have argued that the traditional boundaries between white-collar and blue-collar workers must be re-examined in view of recent changes in the economy and because the intellectualization of physical labor (eg, an increase in the number of skilled workers in automated plants) and the proletarianization of intellectual work (eg, the existence of a large number of low-grade engineers with only specialized secondary education) have undermined the usefulness of the key criterion used in defining the working class in the USSR, namely, ‘predominantly physical labor.’ Some sociologists have called for more all-inclusive definitions of the working class that emphasize control over the labor process. According to such definitions all wage laborers excluded from control over the labor process would be considered part of the working class. Russian-ruled Ukraine to 1917. Because of the late development of capitalism in Ukraine, a modern working class was formed there only in the mid-19th century. Of course, there existed a work force in industry earlier. In the 16th century some free labor (drawn from among peasants, artisans, and Cossacks) was already employed in premanufacturing and manufacturing enterprises (paper mills, potash and saltpeter works, foundries, and mines). At that time wide use was made of bonded and, later, serf labor in enterprises belonging to landowners and monasteries. The reintroduction of serfdom in Ukraine in the late 17th century by Polish and Russian rulers blocked the development of free labor, which is a precondition for the rise of a working class as a separate social group. In the 18th and the first half of the 19th centuries, most factories in Ukraine utilized bonded or serf labor and were manorial enterprises owned by nobles. State enterprises that used some free labor were rare, and there were relatively few enterprises owned by merchants or foreign colonists that also used free labor. As a result most of the labor force in Ukraine was closely tied to agriculture. In the mid-19th century, in connection with the expansion of industry and the increase in its mechanization, wage labor became more widespread on manorial enterprises. Besides using the labor of serfs under the corvée system of feudal obligations, landowners began offering wages to some of the serfs. The development of the sugar industry and the appearance of large mechanized sugar refineries created new demands for additional labor, which the landowners filled by renting serfs from neighboring estates or by hiring free labor. The growth of industry and the increasing unprofitability of serf labor vis-à-vis free labor undermined the institution of serfdom and hastened the rise of capitalist relations in industry and agriculture and the formation of a working class. Tsarist government statistics show that in 1825 there were some 15,000 workers in industry in Russian-ruled Ukraine. (The data are incomplete because they do not include workers in distilleries and mines or the work force of Tavriia gubernia.) Almost 60 percent of those workers were concentrated in Kyiv gubernia, Poltava gubernia, Kharkiv gubernia, and Chernihiv gubernia. Free wage laborers formed only 25 percent of workers in industry in 1828. Sixty-one percent of the working class in that period worked in fulling mills and the textile industry; 10 percent, in metallurgy and metalworking industry; 9 percent, in saltpeter works; 5 percent, in paper mills; and 15 percent, in other sectors. By 1860 the working class in industry (as defined above) had grown to 85,000 because of the expansion of the labor-intensive sugar industry; 77 percent was concentrated in the aforementioned gubernias. In 1861, free workers constituted 75 percent of all workers. The figures just given underestimate the real size of Russian-ruled Ukraine's working class. In the mid-19th century the gathering of labor statistics was in its infancy in Europe in general and in the Russian Empire in particular. Moreover, it was difficult to establish the size of the working class because many workers retained their ties to the village economy. Ivan Hurzhii estimates the size of the working class in 1861 as approx 200,000: 45,000 in the sugar industry, 25,000 in distilleries, 10,000 in the textile industry, 70,000 in water transportation, and 5,000 in mining, to name some of the major sectors. Not included in the figure were hundreds of thousands of agricultural migrant workers, many of whom traveled long distances to work in Southern Ukraine. The early working class, especially serf laborers, worked under appalling conditions. The entrepreneurial landowners had the right to punish their serfs, and beatings were common, despite the efforts of some government officials to limit abuses. The average working day was 12 to 15 hours, and payment, especially for serf labor, was minimal. The highest-paid workers were locksmiths and blacksmiths. Labor conditions were best in the newly established machine-building plants and engineering works. Before 1861 the vast majority of workers in Russian-ruled Ukraine were Ukrainian. The skilled sectors of that early working class were formed out of urban and rural artisans, many of whom were of Cossack origin, whereas the mass of unskilled workers were from the peasantry. In that period Russians did not predominate in the working class, although many Russians worked in Ukraine, especially as itinerant craftsmen. In 1845 in Kyiv gubernia, for example, Russians made up one-third of the 6,000 craftsmen. The national composition of Ukraine's working class altered dramatically in the second half of the 19th century, because in the postemancipation period (from 1861) industrial capitalism developed much faster in Ukraine than in Russia. The growth was spurred by large-scale foreign investment in Ukrainian industry, particularly in mining and metallurgy. With rapid industrial development a distinct social group of nonagricultural wage laborers came into being. Technicians and engineers arrived from Europe, and the bulk of the labor force, especially in key industrial sectors, was recruited from Russia because suitable labor was in short supply in Ukraine. Between 1861 and 1870 the average annual number of workers in the nine gubernias of Russian-ruled Ukraine was 142,600. Only 13 percent were located in the steppe gubernias of Southern Ukraine and the Donets Basin. By 1900 the working class had grown to 327,400, 46 percent of it in the steppe gubernias. (The figures include only workers in industrial enterprises with motor power with at least 16 workers, or those without motor power with at least 30 workers.) In 1897 there were 425,000 industrial workers in Russian-ruled Ukraine, almost half of them in the steppe gubernias. Over 65,000 workers were employed in mining and metallurgy. The industrial working class made up 7 percent of the employed population. By 1913 a further concentration of workers in mining and metallurgy had taken place. That year the working class numbered 642,308; 45 percent worked in mining and metallurgy. Census data give some idea of how much of industry's labor needs were met by Russian labor. According to Mykola Porsh's analysis of the data, 42 percent of the 425,000 industrial workers in Russian-ruled Ukraine were born beyond its borders. Two-thirds of those migrants settled in the industrial south and gravitated toward the large enterprises. In 1892, for example, 80 percent of the labor force in the mines and factories of Yuzivka (now Donetsk) had come from the Moscow area. In 1897 Ukrainians formed 32 percent of the industrial working class, and a quarter worked in the mines, and a third, in metallurgy. Data suggest that the rate of the Ukrainians' industrial migration tended to increase as the economy grew, and as mechanized agriculture made them increasingly superfluous as an agricultural labor force. 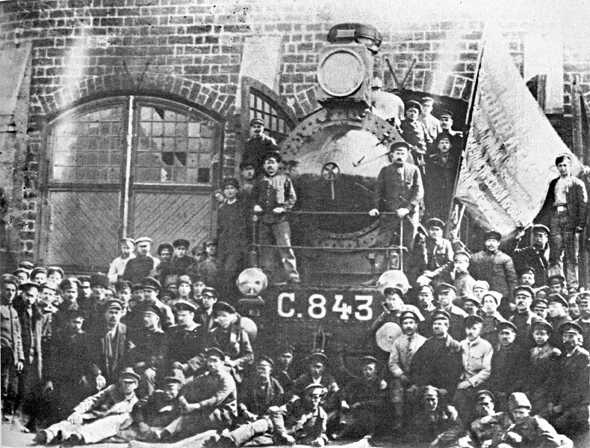 In 1871, for example, only 14 percent of Donbas miners originated from the Ukrainian gubernias. By 1914 almost half the new recruits in the mines were Ukrainian. Such changes, however, did not occur on a large enough scale to alter the national composition of the working class before the Revolution of 1917. The total number of workers in Russian-ruled Ukraine in 1897 (including all nonindustrial sectors except agriculture) is estimated at 1.5 million, of whom 44 percent were Ukrainians. (Seasonal agricultural workers in that period numbered approximately 2 million.) Ukrainians tended to predominate in the most unskilled sectors; over half of the day laborers were Ukrainian. The vast majority of Ukrainian workers were located in Right-Bank Ukraine and Left-Bank Ukraine gubernias rather than the steppe gubernias. Only a small proportion of Ukrainian workers worked in towns; most labored in enterprises located in rural areas. Russian-ruled Ukraine was characterized by an unusually high proportion of temporary workers in its factory proletariat. Studies of the Donbas reveal that almost all temporary workers there were Ukrainian. Women represented 9.3 percent of industrial workers in 1897; the vast majority worked in the clothing industry, where they accounted for one-third of the total number of workers (including nonindustrial ones). The working class in the steppe gubernias reflects the uneven industrial development of Ukraine. Enterprises in Katerynoslav gubernia (including the Donbas) were relatively modern, utilized much greater horsepower per worker than industries in Russia proper, and employed very large work forces. In 1902, for example, 69 percent of all industrial workers in Russian-ruled Ukraine laboring in factories with over 1,000 employees were in that gubernia. As early as 1894, two-thirds of all enterprises in the gubernia employed not fewer than 500 workers, and the highest-paid workers in the Russian Empire (excluding Finland) worked in the gubernia. Wages in Right-Bank Ukraine and Left-Bank Ukraine (except in the city of Kharkiv), however, were among the lowest in the empire, and compared to that in Western Europe, the standard of living of workers in Ukraine was very low. In 1910 the average wage of industrial workers in Russian-ruled Ukraine was less than one-quarter that of their Western European counterparts. Housing and working conditions, especially in the mining areas, were among the worst in Europe. In 1897, 52 percent of Ukraine's industrial working class were illiterate (among metallurgists, 33 percent). The expansion of the Russian defense industry during the First World War resulted in the growth of Ukraine's industrial working class from 631,000 in 1914 to 812,500 in 1916. Using contemporary Soviet definitions, Mykhailo Rubach calculated that in 1917 the working class in Ukraine numbered 3.6 million, of whom 893,000 were industrial workers, 121,000 were railway workers, 230,000 were employed in urban artisan production, 300,000 worked in construction, 444,000 labored in village artisan enterprises, 365,000 were servants, 59,000 were employed in trade and urban transit, and 1.2 million were agricultural laborers. With their dependents the working class thus broadly defined numbered 6.5 million people, or 20.8 percent of the total population of Ukraine in 1917. Interwar Soviet Ukraine. During the Ukrainian-Soviet War, 1917–21, much of Ukraine's industry was destroyed, and economic chaos resulted in massive deproletarianization of the population. Soviet compulsory mobilizations of workers and the general militarization of labor did not stop the flight from factories. In 1921 Soviet Ukraine had only 260,000 factory workers, who constituted little more than 1 percent of the total population. During the period of the New Economic Policy (NEP) economic recovery began, and the working class began to reconstitute itself. The number of factory workers had increased to 360,000 by 1924 and 675,000 by 1927. The total work force (industry, transportation, and communications) more than doubled between 1924 and 1927, from 1.2 to 2.7 million. In 1927, women made up 14 percent of all workers. What was significant about the new working class was that for the first time in the history of the country the majority of new recruits were Ukrainian. Trade-union membership data show that the number of Ukrainians had increased from 41 percent of the total membership in 1923 to 57 percent by the autumn of 1929. The most complete record of the working class is provided by the 1926 general population census. It reveals that 55 percent of Soviet Ukraine's 1.1 million workers were Ukrainians, 29 percent were Russians, and 9 percent were Jews. Ukrainians formed 43 percent of the 509,000 workers in industry and manufacturing, 66 percent of the 143,000 workers in transportation, and 81 percent of the 160,000 agricultural workers. During the upsurge in the economy in the second half of the 1920s, the weight of Ukrainians in the working class increased. According to a trade-union census, between the winter of 1926 and the autumn of 1929 the number of Ukrainians in industry increased from 41 to 48 percent; among miners, an occupation Ukrainians traditionally eschewed, it increased from 36 to 40 percent. In the younger age-groups Ukrainians predominated, and they constituted 62 percent of all industrial trainees. In the tsarist era most workers never attended a Ukrainian-language school or read a Ukrainian-language newspaper or book, and acquired their literacy and elementary exposure to culture in the Russian language. As a result the working class was by and large Russified. During the 1920s, however, as a result of the policy of Ukrainization, the use of the Ukrainian language and the popularity of Ukrainian culture increased substantially within the working class. Between 1926 and 1929 the proportion of workers in industry who read Ukrainian publications increased from 22 to 43 percent. By the autumn of 1929 half of the industrial trade unions were conducting their business in Ukrainian. The new agrarian conditions under the New Economic Policy forced many peasants to seek nonagricultural employment to supplement their meager incomes. Between 1926 and 1929, for example, 23 percent of workers in metallurgy still owned land. Because wages in industry were much higher than agrarian incomes, however, and industrial workers had the added advantage of social security and a shorter workday, nonagricultural employment became the chief source of livelihood. During the First Five-Year Plan (1928–33) the working class in Ukraine expanded rapidly. Escaping collectivization and attracted by the higher standard of living and the opportunities for social mobility offered by industrial employment, hundreds of thousands of peasants moved en masse into urban centers and filled the labor needs of rapidly growing industry. By 1930, for example, almost 80 percent of the new recruits in the Donbas mines were Ukrainian peasants. The workers entering industry were also very young. By 1933, 40 percent of Soviet Ukraine's working class were less than 23 years old. The number of workers in heavy industry had expanded from 607,000 in 1929 to 1.1 million by 1933 and 1.4 million by 1939. In 1940 the number of workers in Ukraine in all sectors was 4.6 million. Between 1926 and 1939 the social weight of the working class increased in Soviet Ukrainian society from 6.2 percent of the economically active population to 37 percent. By 1939, 29 percent of ethnic Ukrainians were part of the working class and constituted 66 percent of all workers. The working class that came into existence during the early years of industrialization was formed when Ukrainization was still in force. At that time the influx of ethnic Ukrainian workers gave fresh impetus to the Ukrainization of the trade unions. By 1932, for example, 56 percent of trade unionists in the Donbas were Ukrainian. By 1933, 88 percent of all factory newspapers, double the figure for 1928, were being published in Ukrainian. In 1933, however, Ukrainization policies implemented within the working class were attacked as counterrevolutionary. The end of Ukrainization coincided with the introduction of a totalitarian factory regime. The working class, like other social classes, became highly atomized and ceased to exist as an interest group. Western Ukraine to 1939. Under Austro-Hungarian rule Western Ukraine remained economically underdeveloped, even in comparison with Russian-ruled Ukraine. Only at the beginning of the 20th century did some industrial development occur, primarily in Galicia through foreign investment in the petroleum industry. In ethnic Ukrainian eastern Galicia the working class in industry, construction, transportation, and trade numbered 66,100 in 1869 and 75,000 in 1902, not including day laborers and agricultural workers. In 1902 the working class numbered 7,000 in Transcarpathia and 6,000 in Bukovyna. There were many seasonal migrant workers and day laborers in Western Ukraine. At the beginning of the 20th century, for instance, there were only 4,000 full-time workers in the petroleum industry, but 10,000 seasonal workers. The landless and land-poor peasantry also formed a large corps of agricultural day laborers and seasonal workers. In addition, some 75,000 Ukrainians left Galicia each year between 1907 and 1912 to work on a seasonal basis in Germany (primarily Prussia), Czechoslovakia, Denmark, and Romania. Some 700,000 to 800,000 emigrated to the United States of America, Canada, and Brazil. Ukrainians were poorly represented among full-time workers. In Galicia in 1900, they formed only 15–18 percent of the 20,000 full-time workers, whereas Poles made up 56 percent, and Jews, 25 percent. Women in Galicia in 1900 formed only 9 percent of workers. In Transcarpathia Ukrainians accounted for 20 percent of the permanent labor force. The standard of living of workers in Western Ukraine was very low. They received subsistence wages and lived in primitive housing. In Lviv in 1910, for example, 48 percent of workers lived in rooms without beds. Seasonal workers, the overwhelming majority of whom were Ukrainians, lived in even worse material conditions. In the interwar period, conditions in Galicia and Volhynia deteriorated under Polish rule. Emigration abroad was reduced, and there was little industrial development to absorb the surplus rural population. Mass unemployment ensued, especially during the Great Depression. Between 1929 and 1933 the real wages of workers declined by 45 percent. In 1931 there were 393,700 workers in industry, of whom 34 percent were Ukrainians. Ukrainians accounted for 62 percent of all 341,400 agricultural workers. Ukraine since 1940. In 1940 there were 4.6 million workers on the territory of present-day Ukraine. During the Second World War some one million were drafted into the Red Army, and many others were evacuated by the Soviets to the east. More than two million people were taken by the Nazis to work in Germany (see Ostarbeiter). During the war Ukraine's economy was devastated, and by 1944 there were only 615,000 workers in Ukraine. Because millions of men died in the war, there was an acute shortage of able-bodied male workers. Thus, in the postwar reconstruction period women became a major source of industrial labor. By 1950, 38 percent of Ukraine's industrial workers were women. The authorities made access to higher education more difficult in order to stream young people into the working class (see Social mobility). Through the organized recruitment of workers over two million workers were placed in jobs between 1946 and 1962, and 812,000 were sent to work outside Ukraine elsewhere in the USSR. Ukraine's working class numbered 7.9 million by 1960 and 11.6 million by 1970. The number of workers in agriculture (state farmers and collective farmers) declined, however, from 8.7 million in 1959 to 5.8 million in 1970. In 1970 the largest nonagricultural sector of the working class was in trade and the service industry (3.0 million), followed by machine building and the metalworking industry (2.8 million), transportation and communications (2.2 million), construction industry (1 million), and light industry (960,000). Ukraine's working class was highly concentrated, with two-thirds employed in factories containing over 1,000 workers. Indicative of larger economic problems was the fact that the rapid growth of Ukraine's working class was brought about to a significant degree by a level of labor productivity much below the USSR norm. What that fact pointed to was inadequate industrial investment and poor mechanization, which in turn produced a conflicting factory regime. In the Donbas, for example, because new investment in mining was meager, workers' safety was allowed to deteriorate, and major unrest occurred as a result. Such inadequacies existed because between 1959 and 1970 half the total capital formed in Ukraine was reinvested in the USSR outside the republic (see Capital investment). Consequently the earned income of workers in Ukraine slipped from sixth place among 15 Soviet republics in 1960 to ninth place in 1970. In the post-Stalin period many of the Draconian labor laws introduced in the 1930s were abolished, and their abolition paved the way for greater labor turnover and mobility—a principal mechanism for expressing workers' dissatisfaction with their pay and working conditions. In 1970, for example, almost 30 percent of workers changed jobs. Moreover, because of the influx of young educated workers into the labor force, the working class as a whole had higher expectations. In 1970, one-third of all workers in Ukraine, and 46 percent of machine-building and metal workers, were under the age of 29. Ukraine's working class was among the best educated in the USSR. In 1979, for example, 28.8 percent of all workers in Russia had secondary education, and 8.5 percent had either incomplete higher or specialized secondary educations (see Secondary special education). In Ukraine the corresponding figures were 40 and 9.8 percent, and 63 percent of young people entering the blue-collar work force for the first time had secondary education. Women formed 48 percent of Ukraine's working class in 1970. One-third of all workers in Ukraine that year were located in the western or central-western oblasts of the republic. In 1959, 70 percent of the working class was Ukrainian. By 1970 their share had increased to 74 percent. By the mid-1960s, 70 percent of all industrial workers in the republic, 78 percent of railway workers, 72 percent of workers in the chemical industry, and 70 percent of machine-building and metal workers were ethnic Ukrainians. In 1980 there were 14.1 million workers in Ukraine, and in 1988, 14.3 million. In 1979, 55 percent of the population of Ukraine was classified as belonging to the working class, and 56 percent of ethnic Ukrainians in the republic belonged to that category. In 1987 there were 6.2 million industrial workers in the republic. The average monthly wage for both white- and blue-collar workers in Ukraine in 1987 was 185 rubles. That was below the USSR monthly wage of 202.9 rubles and the RSFSR wage of 216.1 rubles. The per capita family income of Ukraine's industrial workers was 163 rubles in 1988. The largest expense for a working-class family has been food. In 1988 over 35 percent of family income was spent on food. In the late 1980s Ukraine has seen the rise of a working-class movement independent of official trade unions. Strikes became a common form of protest against difficult living conditions and shortages of all kinds. Workers challenged the monopoly of power that the Communist Party enjoyed until September 1991 and have called for workers' control, protested the privileges of the elite, supported demands for social and political reform, and, especially in Western Ukraine, played an important role in the national movement. In the 1990s the working class faced uncertainty with the transition from a command to a market economy. Among the most worrisome consequences of these economic reform was the threat of large-scale unemployment.